When it comes to stylish colour combinations and geometric prints, Missoni has been doing it the longest and, arguably, the best. The famed Italian fashion house was one of the first to branch out into interior design – proof of its pioneering attitude. Its runway collections have been described as wearable art and the label’s much-loved prints have transferred seamlessly into the realm of interiors. 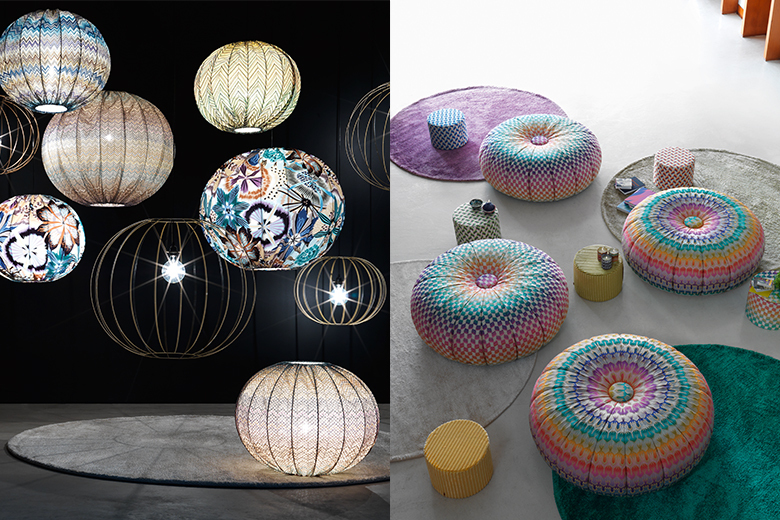 In the modern-day world of throwaway fashion and interiors, Missoni stands out from the crowd by offering those with a penchant for quality, creations without an expiration date. Combining a contemporary flavour with age-old luxury materials, the brand’s interiors branch, Missoni Home, satisfies the modern and traditional cravings of the interior-savvy contingent in one fell swoop. The Missoni story starts way back in 1953 when its founder Ottavio and Rosita married and set up a small knitwear shop in Italy. Together they built their small family firm into a fashion juggernaut with the help of their daughter, Angela, and her two brothers, Vittorio and Luca. The brand’s eye for mixing and matching colours to kaleidoscopic effect – from simple stripes to captivating chevrons – earned it a global reputation. With fashion lines for women, men and children as well as beachwear, fragrances and accessories, it seems there’s nothing the brand can’t do. After giving many faithful years to the company, Rosita stepped down in 1997, handing her Creative Director crown to her daughter Angela. But like so many creatives, Rosita couldn’t fight the urge to keep her forward-thinking mind ticking so launched Missoni Home in 2004 and, in 2009, began designing the first Missoni hotel in Edinburgh, followed by other luxurious locations including Brazil and Kuwait. Resilient and refusing to back down to fashion changes and personal tragedy, the brand reigns supreme and is still thriving to this date. The notion of home is one of the closest to Rosita’s heart. “The home is alive,” Rosita explains, “It’s constantly evolving and never finished.” It’s this belief that gave her the ammunition to expand into interiors and give stylish homeowners the option to dress their home, as well as themselves, in the brand’s iconic prints. The beauty of Missoni Home is that it boasts liveability as well as visual beauty. Thanks to their cocktail of colours, its creations successfully carry an informality and warm welcome, without compromising on luxury appeal. 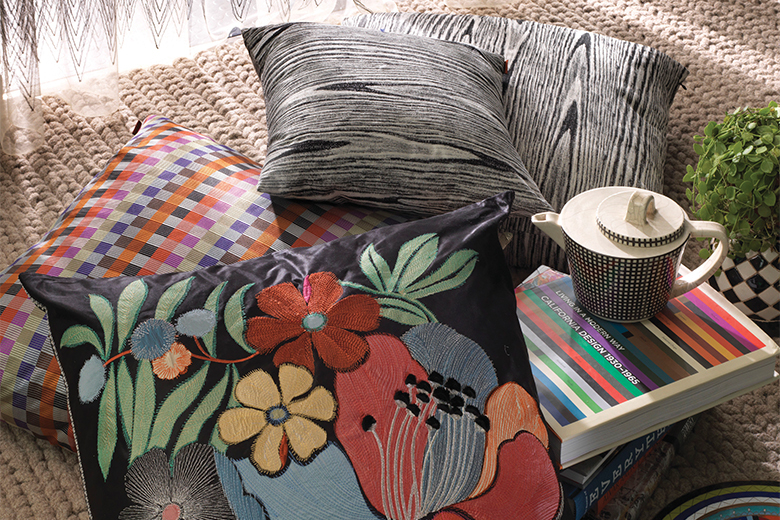 Because of its flair with fabrics, Missoni Home’s soft accessories are probably what the brand is best know for. It uses a range of weaving, knitting and embroidery techniques to create its tactile fabrics that look incredible and feel even better. Style-savvy homeowners can cocoon themselves in soft designs – usually crafted from pure cotton and silk – including throws, towels, dressing gowns and bedding, or sit back and relax with the help of its sumptuous cushions and rugs. 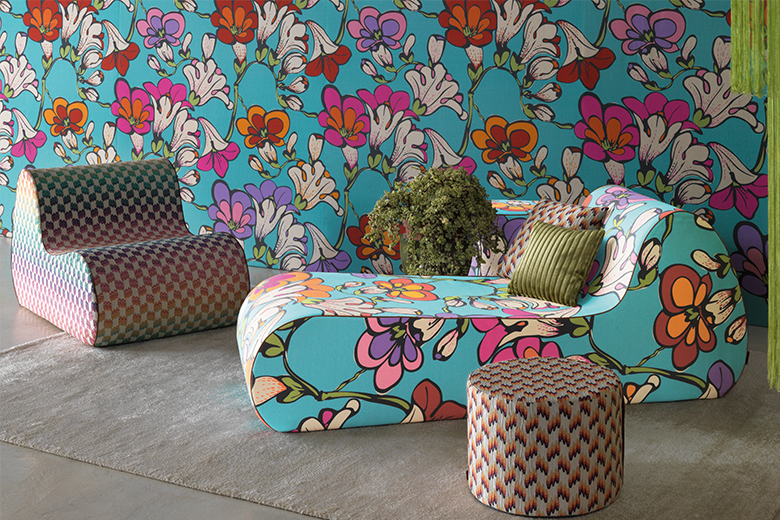 Like the brand’s soft furnishings, its home accents also work statement prints with glamorous 1970s sensibility. Credit is due as the brand doesn’t just rely on the iconic zigzag prints that catapulted it to international success, but instead continues to experiment and design striking pattern after pattern. As well as playing with lines, the brand’s assortment of home accents, which ranges from vases, candles and storage baskets to lighting and fine porcelain dinnerware, come in an eclectic mix of prints. Simple block colours, oversized floral motifs and prints evoking thoughts of precious jewels are just a few of the looks Missoni Home has to offer. A house isn’t a home until it’s complete with beautiful furniture and Missoni Home makes that quest easy for homeowners. Successfully taking its high-impact prints from catwalk to cushion to couch, the brand executes its sofa designs with its usual finesse. Beds, chair and pouffes also make up its furniture offerings all of which flaunt innovative silhouettes, and because the dynamic brand is relentlessly exploring other fields, it also has outdoor furniture under its belt. Its arresting deck chairs and sun loungers, like all of its home furnishings, parade colourful energy and immeasurable quality – firmly underlining Missoni Home’s admirable journey from fashion to interiors.